One tends to either loves/uses them or simply ignores/stores them. One loves them and one hates them. Like my tea parties: one attends and one would rather be tortured than come to one of my formal afternoon tea party ladies' gathering. One daughter usually finds lovely teacup treasures -like this pretty blue vintage one - to give to me as a hostess gift....and she happily attends my afternoon teas, dressed in lace and pink and enjoys every single girlie detail of the party. She is an apple of my eye and fun to share/show off to my tea ladies. And my other apple, my younger daughter who just moved back from San Diego-surfer-girl-tom-boy-daughter who wears black, grey or navy almost exclusively and knows how to fix stuff? And when the tea is all over and they return from doing boyish tomboy things, they eat up the leftovers and yummy sweets left behind and hug me and help clean up..........and let me regale them with party faire. Well I guess all this tea stuff just isn't her cup of tea. And, frankly, I am glad of it. What a boring world it would be if we were all exactly the same. Lovely photo's, the cup is beautiful. Indeed, it would be a boring world if we were all alike! Isn't it wonderful that one daughter likes to spend time with her father, looking at guy stuff, while the other enjoys girly stuff! Our families are made up of different personalities and each child is a gift, possessing his or her own special talents and giftings. Your blue teacup is very pretty and shows very well. Thank you for joining me for tea today and have a splendid day, my friend. How fun to have 2 such different girls! My daughter was an athlete type (who now does triathalons in her 40s) and couldn't ever have cared less about tea parties, so I know your pain! LOL! So glad you have one that enjoys them with you! I love your gorgeous blue cup! Thanks for sharing and linking to Tuesday Cuppa Tea! The tea cup is gorgeous and I LOVED this story. How true -- what a boring world if we were all alike! Sounds like you have two lovely, perfect girls who know what they like! such an elegant setting! now that's what I call blue....exceptional photos..
what a sweet story. I love how you enjoy your very different girls. Each is developing her special way to live. How nice that one is enjoying the same hobby like you. Your blue tea cup and the virgnette with the blue flowers are wonderful. Fantastic Blue Tea Party! Beautiful Pics! I can identify with two daughters and separate likes. Unfortunately neither of mine care to do the tea thing any more, at least not with tea cups! I am smitten by this beautiful blue teacup; it is unique and I hope you use it often. beautiful tea cup! you have two interesting apples :) i'm sure they are unique in every ways. God bless them. 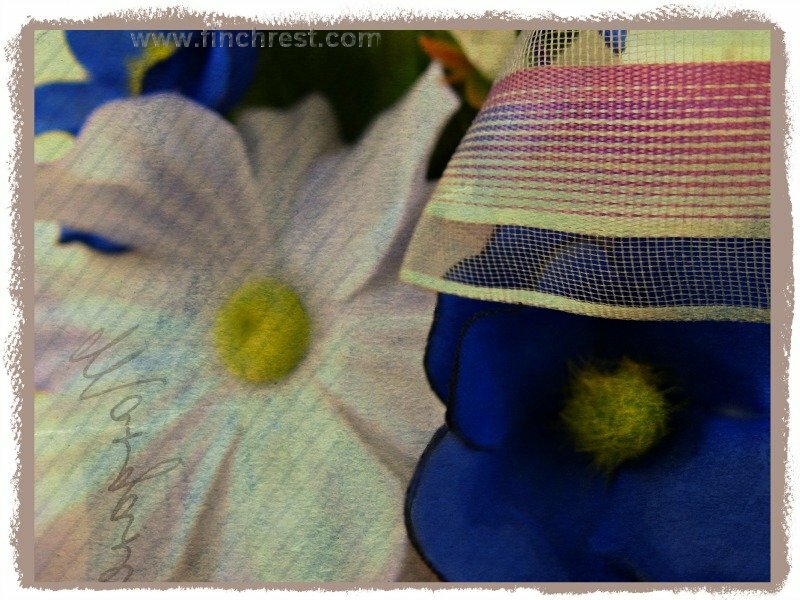 Hope you can stop by at my blog: Blue Monday. Aren't you fortunate to have a daughter to share tea time with and another to have a cup of coffee with? Happy Blue Monday, Michele. Absolutely! That tea cup is lovely & unique, just like each of your daughters. 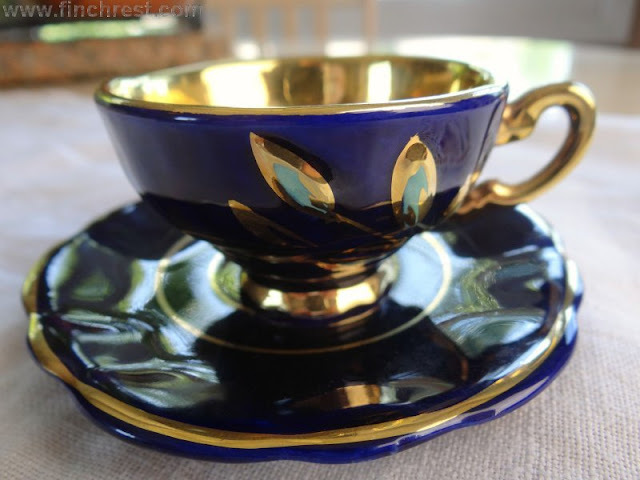 I love the Royal Blue teacup!! What a gorgeous teacup! I'm glad you have one daughter who shares your interest in tea. I know the other daughter is a sweetheart too. Not liking foo-foo and delicate teacups isn't a fault; it's unique. You're right about that, Michele...it would be a boring world if we all beat to the same drummer!!! That was sooo cute and so great how you appreciate both your sweet girls. Your daughters sound delightful with their different personalities. That teacup is very pretty. I like the deep cobalt blue. I also enjoy fancy tea parties. Have a lovely week. It sure does take different personalities tomake this world go round. 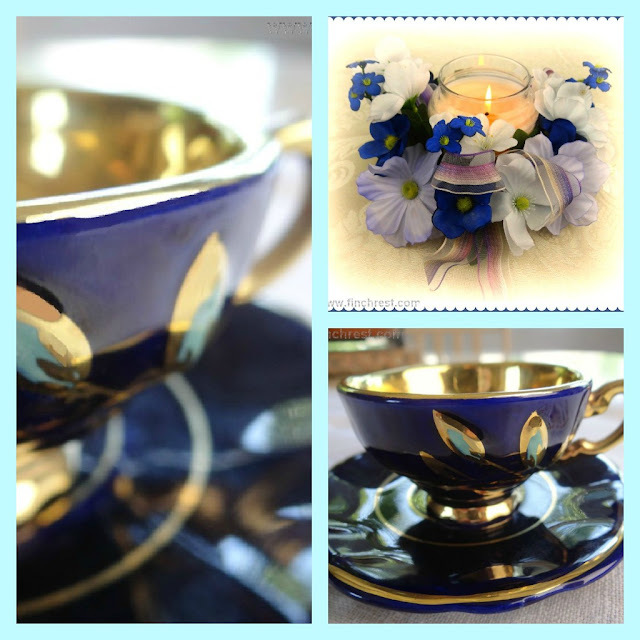 Your story pretty much describes I think most families.....like mine:) Hey love the blue tea cup and your blue flower vignette. SO pretty. Looks like you're aving a wonderful summer. I've missed everyones blog posts and have so much catching up to do. aLuv ya girlfriend! Lovely teacup and beautiful story. I have 2 boys, and they are both soooo different, but like you said, that is fine by me. Tea for two, tea in blue--what could be better? 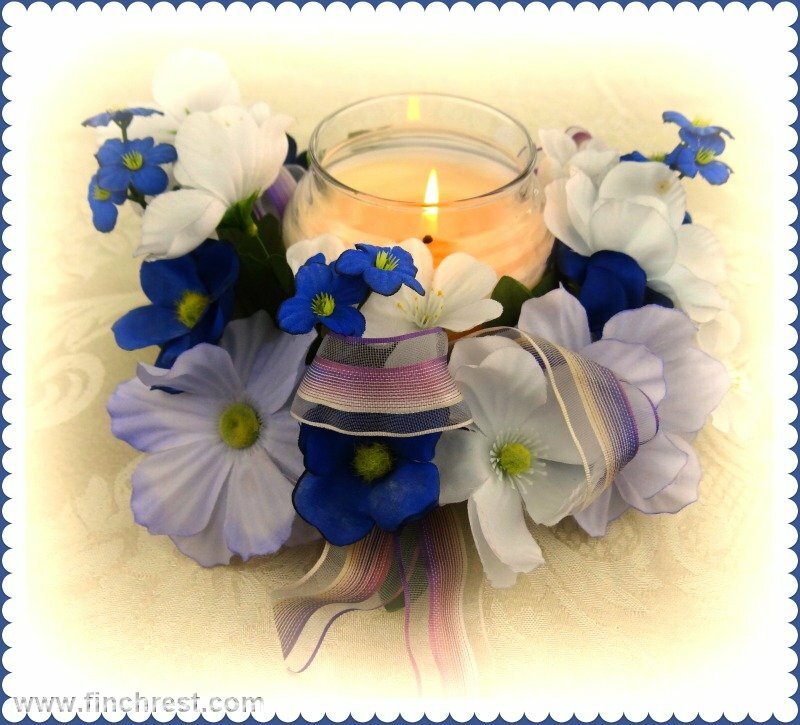 What a beautiful cobalt blue teacup and flower arrangement. Love your story about your girl's! Made me giggle! It's funny how your kid's can have totally different personalities. Lovely Post! Have a nice week. what a regal looking cup - beautiful! Michele, sounds like you have the best of both worlds in your sweet daughters! You are blessed! 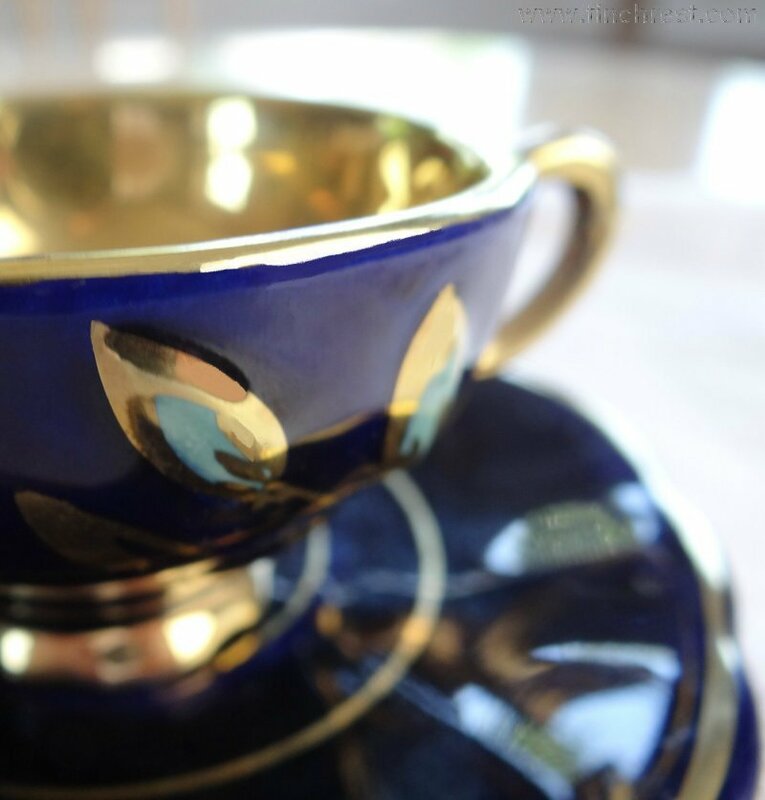 The teacup is rich and opulent! So true, our children are so different and that is a blessing! The teacup is my favorite color. What a thoughtful gift from one of your apples. What a lovely post--and also lovely that you accept and even embrace the differences in your girls. Sweet! That blue teacup is VERY striking! I love it!